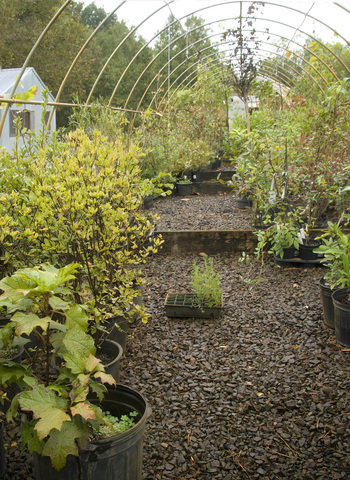 The Adkins Arboretum Native Plant Nursery has offered the Chesapeake Bay gardener the largest selection of ornamental native plants for more than 10 years. The Nursery opens for the season on April 15 and closes for the winter in late October. Native Plant Nursery Hours are Tuesday–Friday, 10 a.m. to 4 p.m., mid-April through October Weekend hours by arrangement. For more information about special orders, special pick-ups, help with restoration projects plant choices, or pricing for nonprofits or commercial contractors, contact Nursery Manager Joanne Healey at 410.634.2847 x32 or jhealey@adkinsarboretum.org. 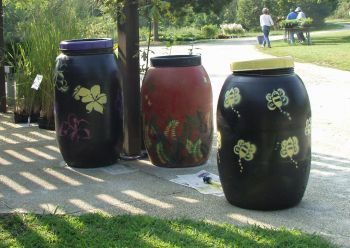 The Arboretum recycles heavy plastic barrels, previously used for food storage, to be used to collect and store rainwater for irrigation. The barrels come already retrofitted with hose attachments and screen lids to prevent mosquitoes from laying eggs and breeding. They are a fun way to conserve and store water, adding interest and beauty to the garden - especially when painted. Buy one already decorated, or decorate your own! Unpainted barrels are $95; painted barrels are $120.